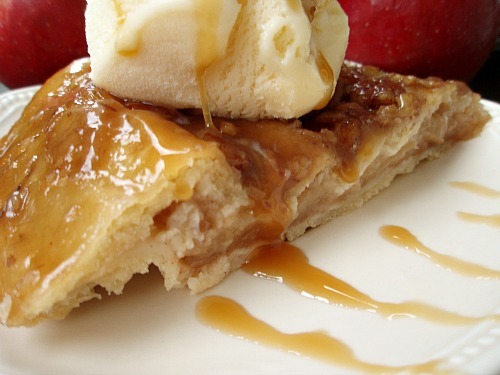 Just when you thought apple pie couldn’t get any better… it does! Not only does this pie look impressive, it tastes amazing, too. 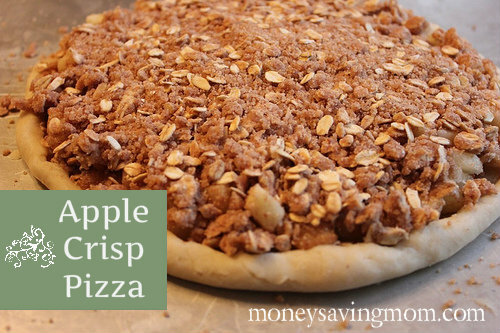 This twist on the classic apple pie is probably my very favorite apple pie of all time. And no, it’s not even close to low-fat, but let me assure you that it’s worth every blissful calorie! One taste of the caramelized pecan-studded crust, and you may never be able to settle for regular apple pie again. We served a pie similar to this at a Victorian tea room that Crystal and I waitressed at for several years (a loooong time ago! ), and it was always a favorite on the menu during the fall. This is my adaptation of that recipe. Although this pie would be a fabulous addition to your Thanksgiving menu, there’s no need to wait until then to enjoy it! Preheat the oven to 400 degrees. Melt the 3 Tablespoons butter in a deep dish* 9-inch pie pan. 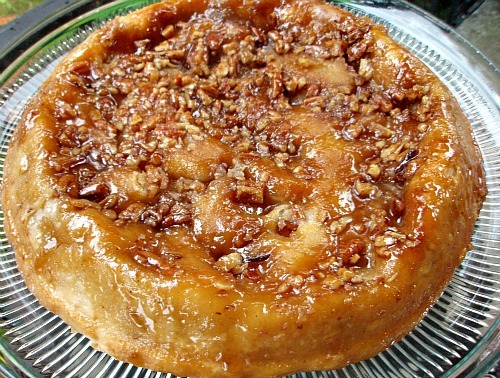 Sprinkle with brown sugar and pecans and drizzle with maple syrup. Top with one of the pie crusts (rolled to an 11” circle). 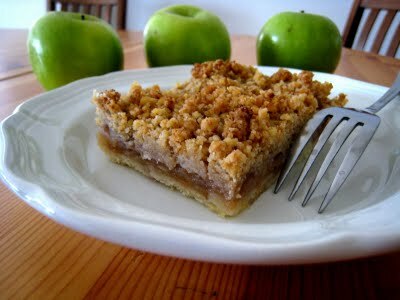 Mound apple slices into crust and sprinkle with lemon juice. Combine sugar, flour, cinnamon, nutmeg, and salt. Sprinkle of top of the apples. Drizzle with melted butter. 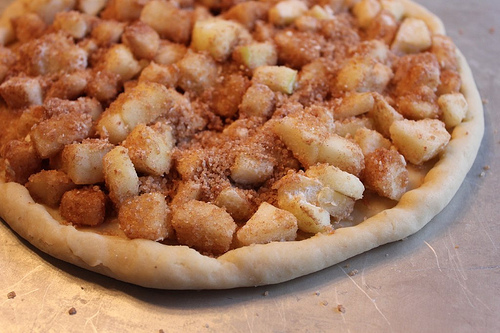 Lay the remaining pie crust on top. Fold the edges of the crust together and crimp to seal. Pierce top with a fork. Bake on the middle rack of the oven at 400 for 15 minutes. Reduce heat to 325 degrees and continue baking for an additional 35-40 minutes. Remove from oven and let cool on a wire rack for 10-15 minutes (no longer!). Loosen sides with a knife. Turn upside down onto a large serving platter. *If you don’t have a deep dish pie pan, you can use a regular one. You’ll want to be sure and put a cookie sheet underneath the pie while baking it as I’ve occasionally had a little of the caramel sauce bubble over. This is fabulous served warm with ice cream! Brigette is a full-time wife and mother who is blessed with three amazing bundles of energy (ages 5, 3 and 1). She enjoys music, experimenting in the kitchen, homeschooling her children, finding great deals, long-distance running, and anything chocolate. 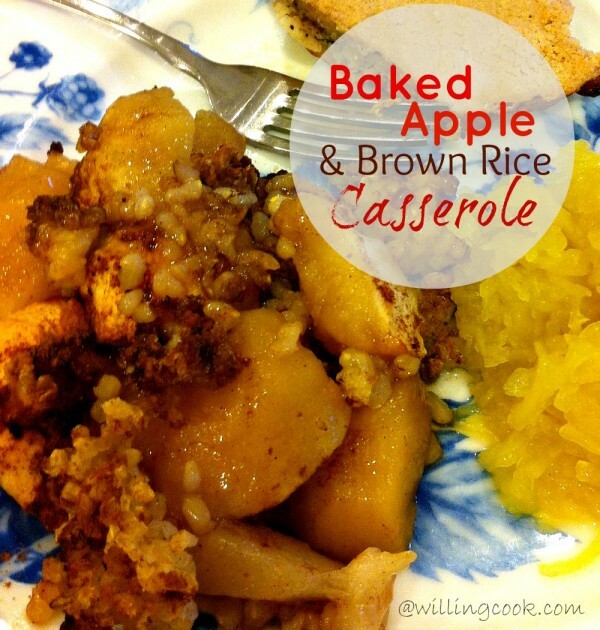 It cannot get any easier than today’s recipe for Baked Apple & Brown Rice Casserole. In fact, I almost feel guilty because it’s just so easy. But, I have been asked for the recipe several times and it’s always a huge hit at our home. My mother-in-law has always made the best baked apples. The kicker is that she hardly does anything to the dish, yet it always turns out delicious. Well, this isn’t her recipe, but I did get one very important tip from her — use a variety of apples and pears. 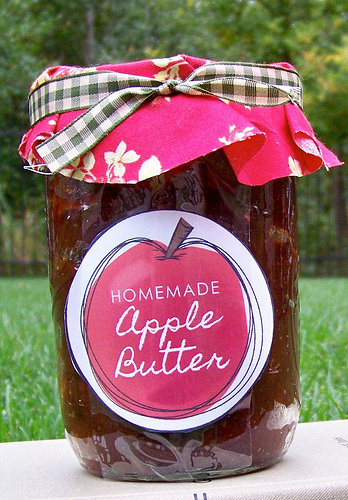 Something about the variation in tartness, juiciness, and sweetness lends to a perfectly melded pan of apple goodness. In this season of our most favorite traditional and bountiful fruit, try this easy baked apple recipe. I promise the whole family will love it and will be asking for the leftovers the next day — if there are any! Cut your apples and pears into large chunks. Skin can be left on or cut off. 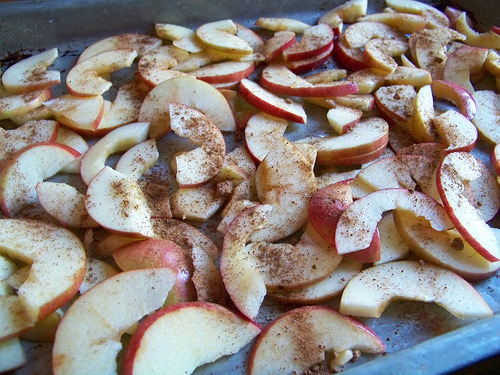 Mix them around on top of your rice until you have enough apples/pears to just about reach the top of the baking dish. Spread your sugar over the fruit. Cut coconut oil into small pieces and stagger across top of apples. 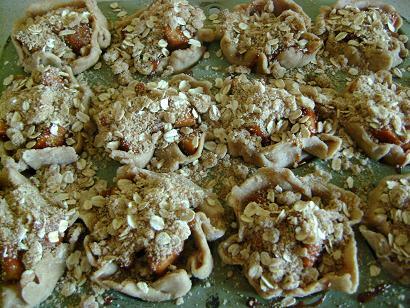 Sprinkle cinnamon and nutmeg across the top and add any additional toppings (optional). 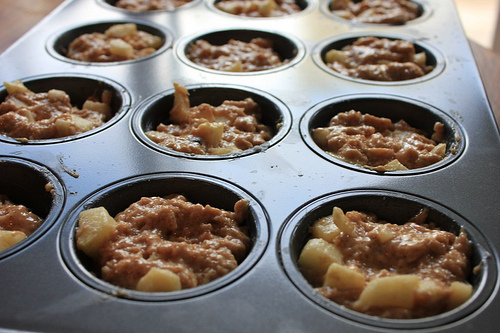 Bake for 30-40 minutes, until apples are soft but not mushy. As always, I have a few notes worth mentioning. ::This dish is naturally allergy-friendly. Yay! 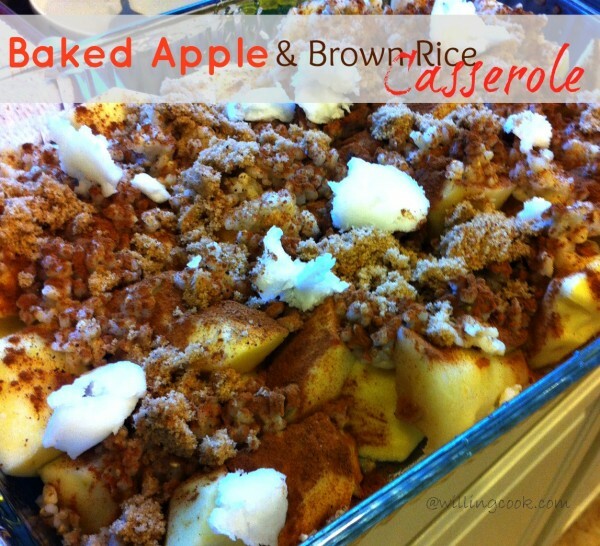 ::I like to cook up a pot of brown rice a day or two before (for another meal) and use the leftovers in this casserole. It’s a great way to get two meals out of one night’s effort of labor. ::Feel free to sprinkle anything on top of the apples that sound good to you. Some options are shredded coconut, raisins, and even nuts. Michelle is blessed to stay home with her three children (ages 10, 7, and 4), while her husband works to provide. When she’s not experimenting with allergy-friendly meals, she’s blogging about it at . Through the Willing Cook, her hope is that you gain peace of mind in your kitchen (and your pocket book) and are able to serve those you love who suffer with food allergies. I love fall. Cool crisp mornings, bright orange pumpkins, breathtaking color, fresh apples from the orchard, football, steaming chai lattes, honeycrisp apples, sweatshirts and jeans, baking, snuggling with blankets and my sweet children, and did I mention apples? I spend the entire year counting down the months until September, when those amazing Honeycrisp apples are finally in season (and thus semi-affordable!) at my favorite orchard. 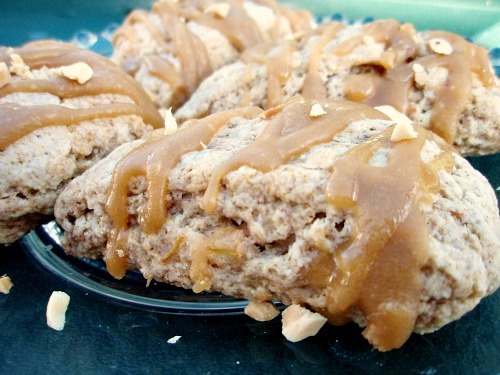 Here’s a recipe that transforms a delicious fall favorite — caramel apples — into tender, flaky scones. 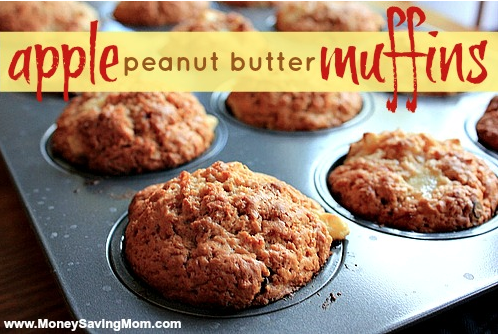 These are perfect with a mug of hot tea or coffee! We like them for breakfast, snack, dessert… pretty much any time of day. They are sophisticated enough to serve as a fancy, not-overly-sweet dessert, but simple enough for everyday. As an added bonus, they will make your house smell good for hours! Preheat oven to 400 degrees. Combine chopped apples and butter in a microwave-safe bowl. Microwave on high for one minute. Stir in cinnamon and vanilla. Set aside. 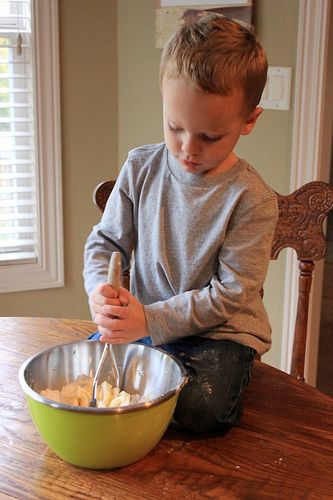 In a separate bowl, mix together flours, sugar, baking powder and salt. Cut in the butter until mixture is the consistency of pea-size lumps. 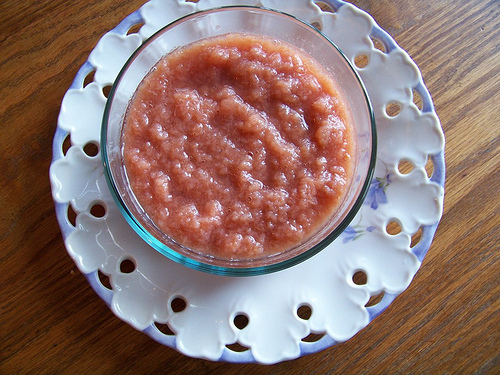 Stir in the applesauce and apple mixture. Add just enough cream or milk until you can form a ball of dough and turn onto a lightly floured board. Knead lightly a couple of times and press into a circle about ¾ inch thick (for smaller size scones, press into two smaller circles ¾ inch thick). Cut into 10 pie-shaped wedges and place on an ungreased cookie sheet (for smaller scones, cut each smaller circle into 8 wedges each). Bake in a preheated oven at 400 degrees for about 15 minutes. Let cool slightly on a wire rack and drizzle with caramel glaze (recipe below) and chopped peanuts if desired. Store in a covered container. These are best served slightly warm (they can be reheated for a few seconds in the microwave). Combine butter, brown sugar and salt in a small saucepan. Stir and bring to a boil over medium-low heat. Continue to stir and cook for another minute. Remove from heat and stir in vanilla and powdered sugar. Whisk in enough apple juice or milk to make the mixture a drizzling consistency (it should be fairly thin, but will harden up some as it cools). 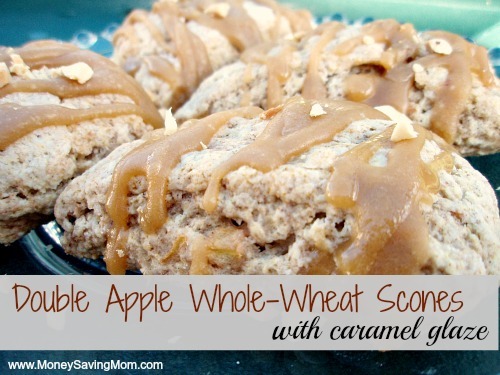 What is your favorite way to use delicious fall apples? 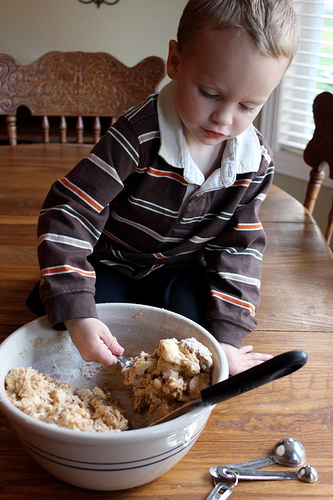 My trusty kitchen helper, Silas, made with me this afternoon. 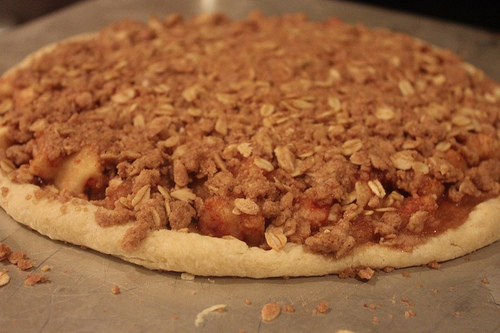 We used since it’s one of those no-fail pie crusts. I couldn’t find my one lone pizza pan (can you believe I’ve survived almost ten years of marriage with one pizza pan?! ), so I made this on a cookie sheet instead. The end result was just as I expected — delicious. I ended up baking it for a little longer than it recommended as the center crust wasn’t quite baked. 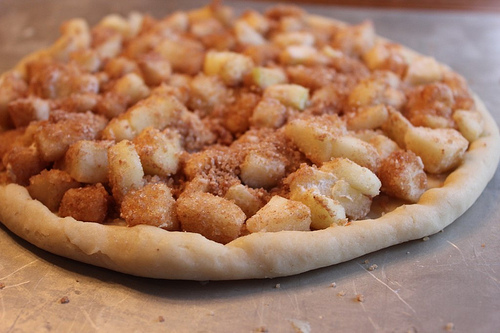 I’m thinking that it might work even better to pre-bake the crust a bit, then top with apples and the crumb topping. Click for the . 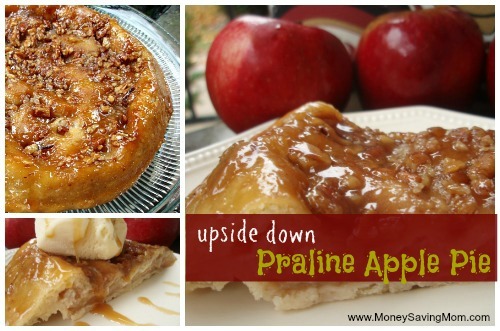 It’s a winner — especially if you love apples, apple pie, and apple crisp! When I saw , I knew I had to try it. It sounded like a creative twist on traditional apple muffins and I mostly just wanted to experiment with it out of curiosity. The end result? Definitely yummy. Different, but yummy. 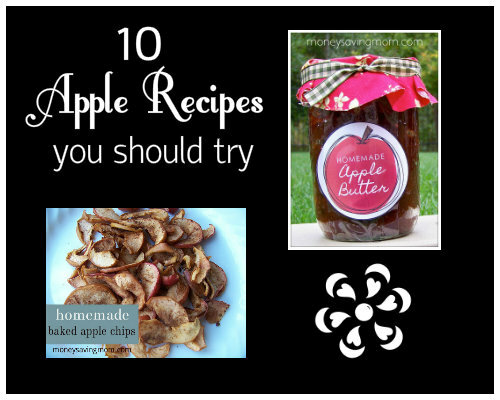 The peanut butter chips add a fun surprise and jive well with the apple flavors. 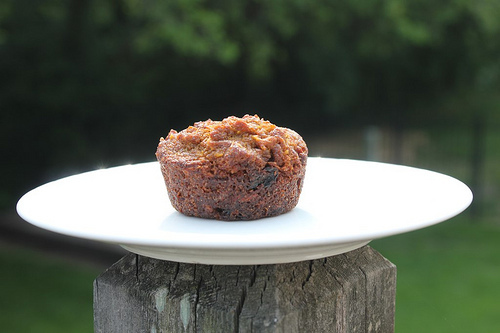 Are these the best muffins I’ve ever tasted? No, but they are good and hearty and perfect for fall! 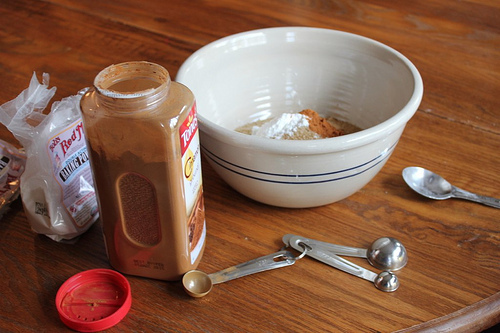 Mix flour, sugar, baking powder, and cinnamon together. Stir in apples. Mix apple juice and oil together. Whisk in egg and stir well. Pour wet ingredients into dry ingredients and stir until just moistened. 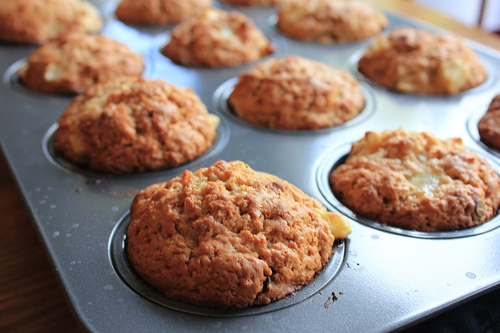 Spoon about 2 Tablespoons batter into greased or paper lined muffin cups. Sprinkle with peanut butter chips. Spoon more batter on top. Bake at 400 degrees for 17-20 minutes until done.